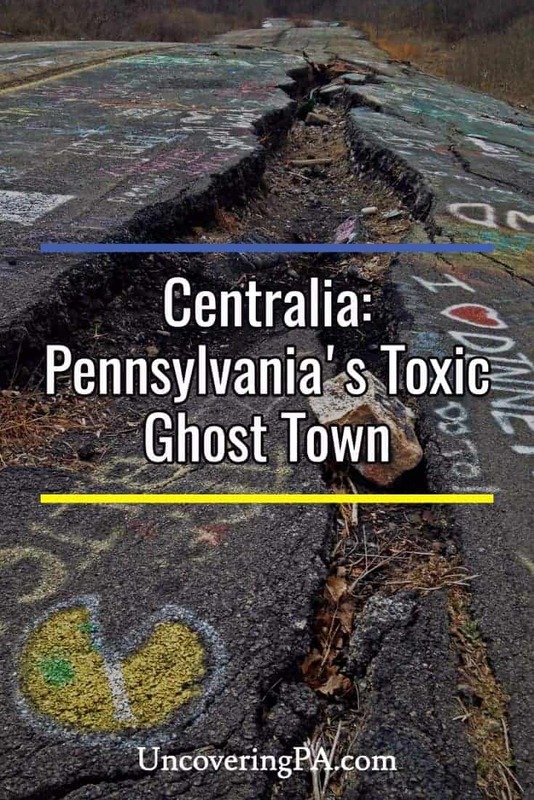 Located in a quiet valley of Columbia County, Pennsylvania, is one of the state’s least likely and least publicized tourist attractions: Centralia. What draws people to this out-of-the-way town isn’t the amazing culture or the fascinating historical sites. Instead, it’s the lack of things to see. You see, Centralia is a modern ghost town. So, what’s the history of the town and what is there to do when visiting Centralia, PA? Keep reading to find out. In the early sixties, the borough of Centralia was just like any number of coal region towns in Pennsylvania. The community of roughly 1,500 was supported by the seam of coal that ran beneath the town. However, in 1962, a fire was lit in the town dump that spread beneath the entire valley and threatened the community’s existence. The full extent of the problem wasn’t known until 1979 when a gas station owner in Centralia measured the temperature of the gas in his underground containers to be more than 100° above normal. The situation escalated further when a 150-foot deep sinkhole opened beneath a 12-year old boy. Fortunately, the boy escaped death, but that was the last straw for many residents of the town. Over the next few years, the Centralia, PA fire continued to burn around the community, increasing the levels of toxic gases like carbon monoxide to dangerous levels. By 1990, only 63 residents remained and by 2012, there were only 10 people left in Centralia. 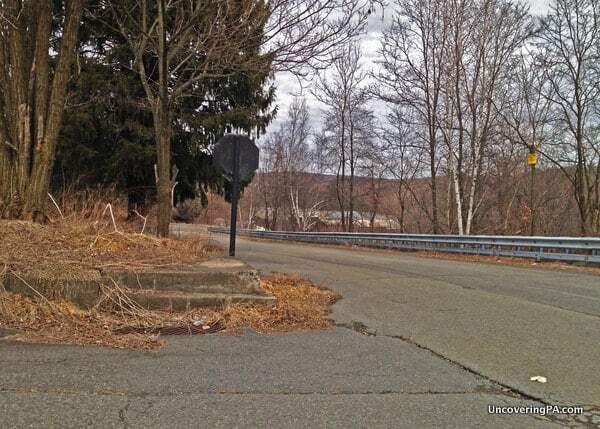 The sign that still welcomes you to the Borough of Centralia, Pennsylvania. Over the last two decades, many of Centralia’s buildings have been torn down. 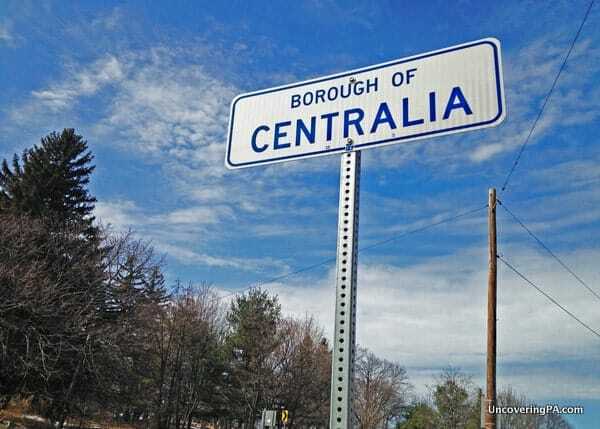 However, there are still things to do in Centralia, PA.
Driving over the mountains from nearby Ashland, you’ll come over the crest of the hill to a marker that still welcomes you to the borough of Centralia. Just down the road are three very well-kept cemeteries. In Odd Fellows Cemetery on your right, it is said that smoke from the fire can sometimes be seen rising through the ground, making for a very eerie scene. Even if there’s no smoke, however, the cemetery is interesting to see as the fence surrounding it and many of the gravestones show signs of how the fire has changed the landscape. The land behind Odd Fellows Cemetery is where the fire is thought to have started. In this area, the effects of the fire can be clearly seen in the scorched earth and the plant life that has survived there. Metal venting tubes dot the landscape here, but little can be seen of the active fire on most days. One of the smoke stacks that dots the land near where the Centralia mine fire started. Continuing downhill into the town center, Centralia, Pennsylvania, almost has the feel of a town destroyed by war. Roads that once led to quiet residential streets now lead nowhere. Sidewalks have buckled under trees along what was once a residential street. Driving down these deserted lanes, you can still see curbs, sidewalks, and front steps, many of which have been upturned by the power of the fire. The few houses that remain sit in isolated pockets around town, surrounded by lots where nature is reclaiming the land once occupied by happy families. A lonely street corner in Centralia. 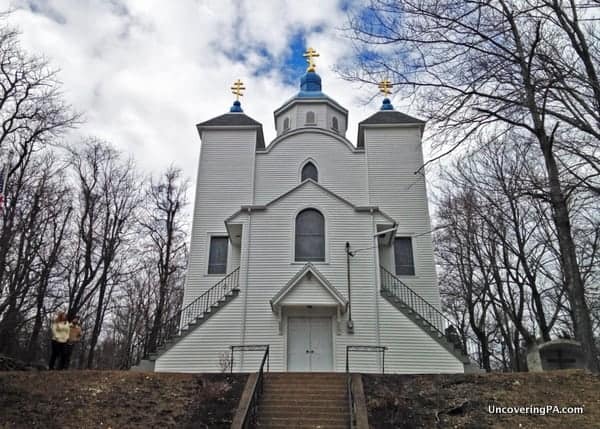 The only spark of color in Centralia is the beautiful Assumption of the Blessed Virgin Mary Ukrainian Greek-Catholic Church which sits on a hill above town and still holds weekly services. One of five churches in town when the first started, it is the only one still standing. Assumption of the Blessed Virgin Mary Ukrainian Greek-Catholic Church, the last remaining church in Centralia. Note: The area around Graffiti Highway is no longer owned by the state and is privately owned. I am unsure of the current situation regarding access for Graffiti Highway. Always obey any “No Trespassing” or “No Parking” signs that you might see. 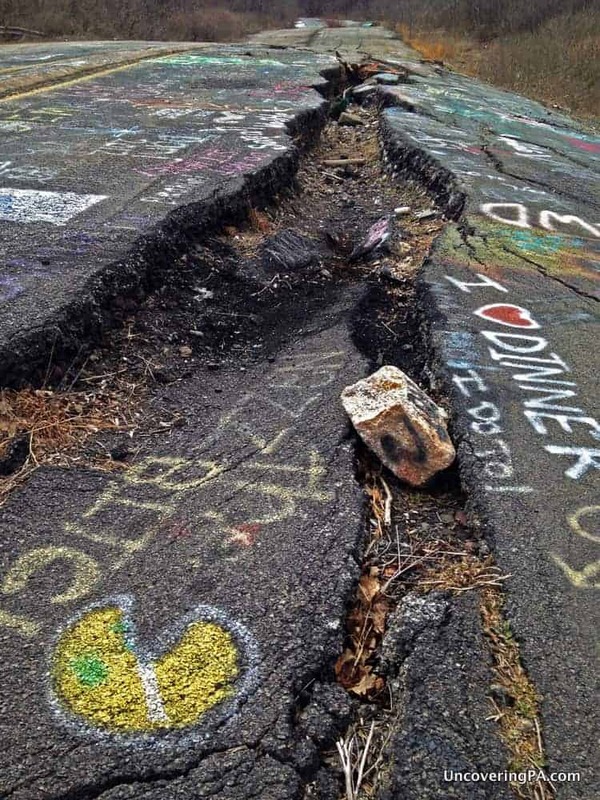 No visit to Centralia, PA, is complete without a visit to the Graffiti Highway. Centralia’s Graffiti Highway is located on what was once Route 61, which runs from Ashland to Centralia. 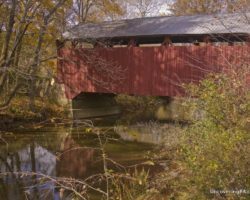 However, the fire necessitated such frequent and expensive repairs to the road, that Route 61 was permanently rerouted around the area in 1994. What was left, was a 3/4 mile stretch of abandoned roadway that can be accessed from a small dirt parking area next to St. Ignatius Cemetery. 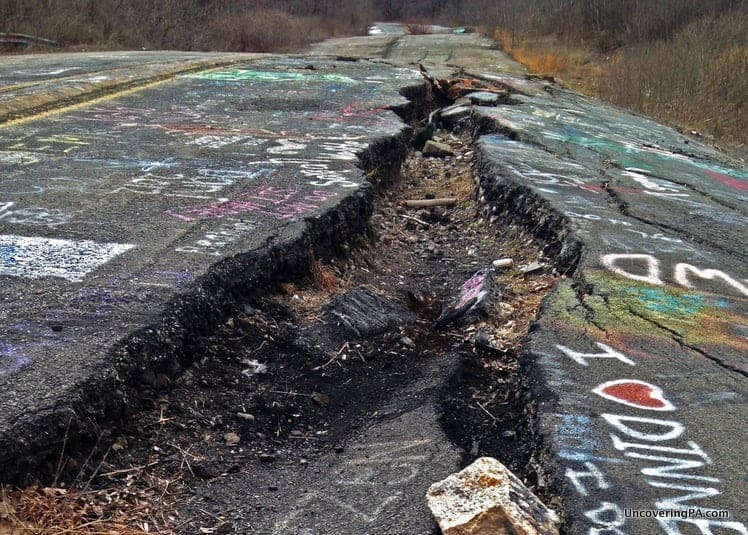 A large crack in the road along the Graffiti Highway in Centralia, Pennsylvania. Today, the road is covered in graffiti. Some of it is insightful sayings and some of it could be considered art. Unfortunately, a high percentage of the graffiti is quite vulgar, a fact worth noting before taking the trip with children. However, those that decide to visit Centralia’s Graffiti Highway are in for a treat because this is the best area to see the destructive power of the fire below. For a large portion of the highway, it looks simply like an overgrown, abandoned road, similar to the Abandoned PA Turnpike near Breezewood. However, in the middle of the destroyed section is a large crack that runs through the road and has to be seen to be believed. A bit further down, the road buckles into a 3-foot tall wall of asphalt. In many ways, it looks more like a set from a blockbuster action movie than a peaceful country highway. There are also reports that smoke can still be seen rising from the ground from time to time in this area. The action movie feel of the Graffiti Highway can make for some great photos. What has happened to Centralia over the past 50 years is quite humbling. However, visiting is a great way to better understand the destructive power of nature. While it might be one of Pennsylvania’s least likely and least publicized tourist attractions, a visit to Centralia, PA is definitely worthwhile. Check out our favorite abandoned places in PA that you can legally visit! Note: There are still residents that live in town, and to my knowledge, all of the remaining buildings are occupied. 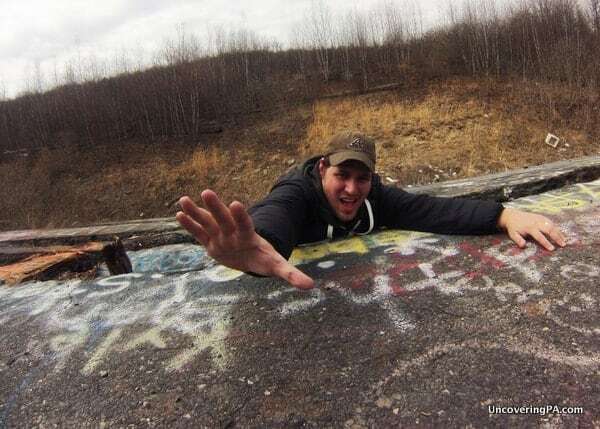 Please make sure that you don’t disturb residents’ property and that you obey any “No Trespassing” signs that you might see while visiting Centralia, Pennsylvania. It’s also a good idea to stay upwind of any smoke or steam that you see rising from the ground as it’s likely toxic. 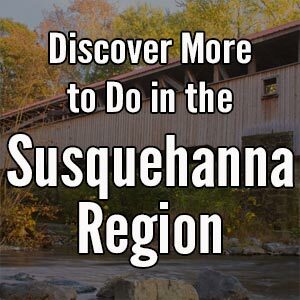 Looking for other things to do near Centralia, PA? 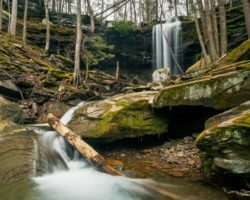 Head to the Pioneer Coal Mine Tunnel, Big Mine Run Geyser, Swatara Falls, Knoebels Amusement Park, or Yuengling Brewery. If you enjoy this modern ghost town, consider this Abandoned Turnpike as your next destination. There is no more smoke or fire in Centrallia. The scenery is just like any other stretch of land full of trees and grass. Thanks to these sites tourist leave behind trash and damaged tombstones.It’s disgusting to visit the graves of family members and have to clean up candy wrappers and drink cups. 4 wheelers tear up the roads to and at the cemeteries. It’s sad and heart breaking to see what has become of this town. The fire gone now for years. The air again is clean. The land full of life. The fire a bad memory. Virginia, It is definitely a shame that people feel it’s okay to leave their trash laying around. I hope that anyone who visits would respect the place and follow the same principles of leaving no trace that they often do when hiking in a state park. Centralia is a beautiful and fascinating place that deserves our respect. Locals bring 4 wheelers and trash. Tourist support local business. Sorry, but there are no local businesses to support. Tourists might make a stop for gas in Frackville, but that is about it. Locals are the ones on 4 wheelers. Ask and they will tell you they live in Ashland, Mt Carmel, and Giardville. They are mostly good people looking for something to do other than heroin. Everyone brings trash there, locals and tourists alike. There are local businesses to support in all of the communities that you mentioned. Tourist sites, restaurants, and, yes, gas stations. You are quite mistaken. The fire is underground and is still burning, with enough fuel to keep it burning for another 250+ years. My fiancé and me spent NYE in a cabin at Rickett Glen State Park (about an hour north of Centrilia). New Years Day we drove to Centralia and walked around for an hour or 2. Stayed outside of the cemetery and walked around through the woods. Saw a few smoke pockets. It being around 3 degrees outside at the time, allowed for a good visuals of these areas. Snow covered ground, graffiti showing through in some areas. Made for some really cool pictures. We have traveled all around looking for strange, out of ordinary, and haunted places. Centrilia was on the bucket list. And it didn’t disappoint. Actually picked up a few spray paint cans and took them to the trash. Recommend goin. But please respect. Virginia, you are incorrect! There is still a fire. Steam can still be found emitting from certain areas around town. You can even place your hands in the cracks on graffiti highway and feel the extreme heat coming from certain areas of the cracks. “The destructive power of nature.” Come again? The fire was started by people, not nature. True, but once the fire was started, nature took over and destroyed the town despite repeated and costly efforts to put the fire out. Please do not walk on the graves or steal flowers off them (this past spring someone stole my flowers off my baby’s grave), and don’t litter. Visit, take pictures, and if possible stay out of the cemeteries. Back in May or June someone tried to open the time capsule. Don’t vandalize and please don’t litter. You aren’t at home and the township cop likes to use the dirt path to hide and wait for speeders. He will arrest you if he sees you littering or stealing or vandalizing property. It’s hard to believe that some people would do that. There is no reason that anyone should treat the cemeteries any differently than a cemetery somewhere else. Just because the town is more or less abandoned doesn’t mean that the graves or cemeteries can be vandalized. Thanks for the reminder, Francine. Don’t walk on the graves? Seriously? I have visited thousands of cemeteries during my research and yes, you can walk on the graves. Some cemeteries don’t have pathways per say, and you have to walk across graves to get to the other graves. As for stealing or vandalizing that is a shame. I was born and raised in Pa and would love to eventually come to Centralia to visit and walk into the Cemetary as I believe I have family buried there,one by the name Ralph Owens so I hope the cops in that area won’t have a problem with me being there,I won’t vandalize but would pay my respects with a visit and take some pics. You are correct Sabrina, I live 3 miles away from Centralia and can assure you, the fire is still burning. Anyone that says anything different obviously isn’t from around here or doesn’t know the area too well. It is not to the extent where there is abundant steam or smoke emitting from the ground or acres of dead vegetation like it was back in the day but it still continues to burn and probably will continue to burn beyond our lifetime. Estimates I’ve seen says there is enough coal for the fire to burn for at least 200 more years. Crazy stuff! Centralia is not a all like Silent Hill! But great fodder for a real story. I wrote a novel, Centralia PA, Devils Fire (Amazon) that depicts with historical accuracy the history of Centralia and combines the fantasy of demons in the mines (metaphorical representations of the mining companies and mine owners.) Much better tale than Silent Hill… There are a couple of new documentaries out and coming out on the town and also a few new historical books written by local authors that are worth looking at. Hello. A friend and I went to Centralia today and we could not see the pipes near where the fire started near the Odd Fellow’s Cemetery. Every tree driving back to make that left was marked with a No Trespassing sign, so we didn’t feel comfortable, although I wasn’t sure if it was just for the woods being off limits or the actual road….Anyone sure? That’s interesting, Keri. I don’t recall the No Trespassing signs being a problem when I went in March, but I suppose they could have put up more since I was there. Truthfully, while somewhat interesting for the history, the pipes themselves aren’t anything amazing, but it’s still a shame if you can’t legally access that area anymore. I remember as a little girl driving with my parents on the newly paved detour of Route 61 into Centralia. Looking left towards old 61 was a forest completely white/gray from being burned from underneath, it was completely surreal and I’ll never forget it. The steam/smoke is still there indeed, it’s much more likely to be visible during the winter cold. Three years ago I got many wonderful photos of a steamy area just to the side of Odd Fellows. The rocks were warm to the touch (we do mind where we stick our noses.. it stinks). One very small correction, Odd Fellows is to the left when coming from Ashland. Thanks for the article. It certainly sounds like you’ve had some exciting visits, Martha. I double checked Google Maps, and according to the maps (as well as my recollections), Odd Fellows Cemetery is on the right, not the left, when driving from Ashland. Saint Ignatius Cemetery and Saints Peter and Paul Cemetery are the ones on the left. You are wrong, Oddfellows is on the right, St. Ignasious is on the left. What you have failed to mention is that residents have been forced to move by the government, claiming right of way (if I remember correctly). Those remaining have refused the buyouts and to leave. Can’t say I blame them, I’d “go down with the ship” so to speak if I was born and raised in Centralia. Eminent domain is when the government takes over the property. Sounds like a fascinating place to visit. Very sad, all around. I visit once in a while, and wrote the eulogy “Centralia PA, Devils Fire,” but I respect the ground on which the town once stood as hallowed ground. If you walk the area and open your mind, your eyes, your ears, and your heart, you can still hear the beat of a small town, its inhabitants busily making their way from one day to the next. You can feel the holiday celebrations and the lives of all the humanity now gone. A town such as Centralia should be held in the same regard as a cemetery, and treated with respect and dignity. Residents were able to make a deal. They received a tidy sum for the houses & could stay living in homes until their death. They don’t pay taxes on the hones. Upon their death after 6 months the homes are to be torn down. They are not supposed to be transferred to others but some are doing just that. Having to leave your home is not easy but they received significant compensation & deals. Lola is 100% correct on this situation from all the research i have done and talking to the very few residents of Centralia that was the plan of the government. the few residents who still remain got a lump sum of money from a court case involving the land. they do not actually own the land but they own the right to live on the land therefore they can not sell or rent the house they live in. they also can not pass the land onto their kin. After the deaths of the current residents all homes will be destroyed. Briefly-my family (grandfather) moved to Centralia in 1913-he was a pharmacist. He died in 1918. He was distributing medicine to people with the flu and contracted it himself and died. Both sides of my family lived in Centralia since the turn of the century. My mom’s side of the family were Gaughen-her maiden name/Laughlin-her married name. Obviously, my dad’s name-Cook. I lived there during the begining of the mine fire days. I have a lot of info and insite if your interested. My father was secretary on the boro council during some of fire time. I would like to get in contact with you. My daughter is visiting Centralia on 3/11/17 for her college PA history for educators class. We have drive by many times while visiting friends in the area. Any information you can provide about Centralia would be greatly appreciated. I always enjoy touring there. Leave nothing but foot prints; take nothing but education and memories. And pictures; lots and lots of pictures. I am from Lower Bucks County and was planning on going up to Centralia in a month or two Sep/Oct. I was wondering if there was anything I should know besides what I have read. I just want to take pictures and look around. I don’t think so, Thomas, but others might feel differently. Just make sure you obey any private property signs, as a few people do still live there. Search Google and download the “before” maps. This will give you an idea as to where things were. The borough hall is still there. The old route 61 with its grafitti is really cool and historical. 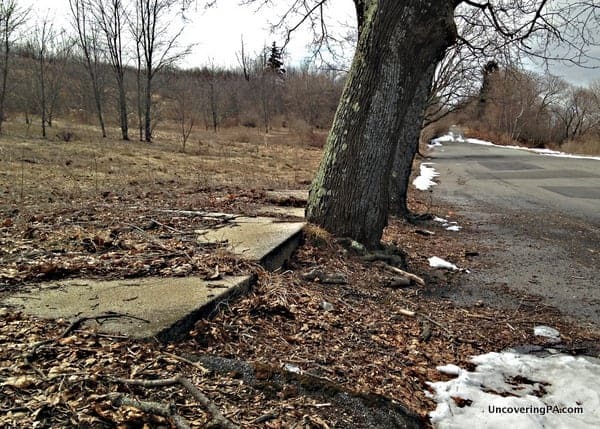 You will need to kind of guess where Centralia is – and park on one of the abandoned roads. Respect the community and the remaining residents and have a blast. It is almost as much fun to watch the rubberneckers (my inspiration for the book I wrote, Centralia PA, Devils Fire.) Take photos and bring a picnic lunch (and plenty of water.) Have fun and be sure to learn the history of the community so you can relate when you are there. Hi Jim – I just wanted to compliment you not only on this Centralia story but on your blog in general. Good work and inspiring to me! I look forward to reading more of your work. Today was bright and sunny on our way home, passing through again. Very disappointing. Since my family is from Mt. 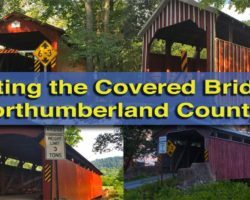 Carmel and Shamokin, I have been through Centralia many, many times. I have been on 61, before it was re-routed, when you’d drive on it with smoke all around you, wondering if your car would sink. (side note: my Nan would always make us take Snake Mountain Road and stop at the springs for water) I found it creepiest in the 80s and 90s when the residents were gone but the smoke and desolation and boarded up buildings were there. If someone didn’t have your blog post, they wouldn’t know where to look or that they should even be looking for anything. Today we just saw a whole lot of nothing–or like the first commenter mentioned, many 4x4s and 4 wheelers parked for off roading in the hills. We also arrived in Ashland too early and the mine was not open yet either. Still, the fair is as good as I remember it and we hit Knoebels several times each year which never disappoints. So if you are on your way up or back from one of those, this makes for an interesting stop, if you know where to look. I would have loved to have seen Centralia 10-15 years ago. It’s still an interesting place to visit, though, if you know where to look. Love reading all of your blogs Jim. I plan on visiting Centralia some time. Never heared of the place until recently. It sure is a shame what happened to all those people. Prayers out to them, and to the ones still there. I hope to visit. I remember reading about Centralia – a terrible, sad and yet fascinating story. Thank you all for the blog, the comments etc. It will help when I visit. Thank you! When I last visited Centralia in the fall of 2015 there were only 5 occupied houses left in the town. The Government reached an agreement in 2013 with the remaining residents, that they may remain in their homes until their demise, then the properties will be re-claimed by the Government and torn down. The homes may not be transferred, or inherited, by any family members. The memorial at the American Legion property is no longer there, and of course the cornerstone was opened in 2014, 2 years early, after it had been vandalized. The property was overgrown with grass and weeds. The park bench which once stood in front of the Legion property on Rt 61 is no longer there. The St. Ignatius and St. Peter and Paul cemeteries were well taken care of, but the Odd Fellows cemetery was overgrown with weeds and grass. I did not observe any No Trespassing signs anywhere, but did note that some barren “lots” were mowed and being taken care of. I surmised these may have been where someone’s home formerly stood and they are keeping it mowed, in memory of where they or family members used to live. The Fire House/Police Station building still stands and has a yellow firetruck inside, which is still being used in the event of fires in the area. The Columbia County Sheriff Dept has jurisdiction of Centralia. The Ukranian church still stands on the hill overlooking the former town, but the stone wall along the road in front of it is crumbling and in great disrepair. I’m hoping it will be restored. The road to the church from the town is greatly overgrown and littered with trash. So sad people have no respect! The church can be easily accessed from the town of Aristes at the top of the hill. The “Wash House” [where miners cleaned up and changed clothes before returning home from the mines], located on Rt 61 a short distance down the hill toward Ashland, had been torn down since my last visit. There was only a small footprint left of where it once stood. If you visit Centralia, please have respect for the remaining residents and their property, and for the 3 cemeteries. Say a prayer for those interred in the cemeteries, and for those who still live there. Jim, I just returned from Centralia. There were a lot of people walking the Graffiti Highway and was able to get my jeep on the highway after seeing some locals driving on the road. I took a picture of my Jeep near the cracks but now after reading about Centrailia I wonder if posting the picture would be admitting to trespassing. I will post the photos tomorrow on my Website, Facebook, and Instagram. No idea. I know they don’t want vehicles on the highway, though. I used to live in lower LAUREL RUN,PA, adjoining WilkesBarre township. We had an underground mine fire which caused the town to relocate to the top of the mountain. A mobile home park sprung up in the area of the fire, because the mobile homes could be moved if necessary. There were many vent stacks and a super hot burning hill of pink calcined ash blowing smoke and steam. The power poles were mounted on high concrete pedestals and snow instantly melted on contacting surface of the access road. I now live in the Philippines and I would like to know the fate of the burning lower section of Laurel Run. Might one of your corespondents visit this interesting area? Your site brings back many memories. That’s interesting, Gordon. Can’t say I’ve ever heard that story before. Not sure if there is anything to report, but I’ll look into it. The Google maps aerial view from 2012 shows smoke still rising. There was also a news report about it on WNEP TV last year. I wrote a novel on Centralia, PA (Centralia PA, Devils Fire) and have done a lot of research on other mine fires in that area. I never really checked out the ones in the Wilkes Barre area (there are about 6 fires currently burning in that area. I will try and make a trip out there to check it out. Maybe fodder for another book? I am thinking about putting together a book about all the mine fires in PA and the history of the communities and the fires. Fascinating. I had no idea that there were other mine fires that were burning in PA.
Gordon, I’m from Mt. Carmel and am getting ready to move to the Philippines. Where are you? As a child my family would travel through Centralia on our way to Pottsville to visit family. I remember asking what the pipes and smoke were. In the last few years I took my son to see it. Would like to do it again soon. Watched the documentary The Town that Was. So interesting! Centralia was such a quaint little town. Such a shame what happened. Unbelievable that a whole town is torn down. Some of the scenes where they were going in with the bulldozers were so sad. As of 2013 there is NO private property in Centralia… The entire former town is owned by the Tax-Payers… Some residents who refused to move were granted permission to live there for the remainder of their life, but the do NOT own the property and therefore have NO right to post No Trespassing Signs! That may be true. However, at a minimum and out of common courtesy, it’s a good idea to avoid the maintained area directly adjacent to their homes. I would have loved to have visited Centralia back. Sadly most of the town is gone, but I still think it’s a fascinating place to visit. Why could they not have dug a large deep trench around the coal to stop it from spreading? I’m surprised that the coal would burn without air or was it close to the surface? Why could they not have pumped water into the ground from a nearby stream or water source to extinguish the burning coal? Jim. They DID pour water and dig ditches around the fire – problem was it was just too big by the time they realized they had a problem (almost 20 years burning.) The PA government was useless by way of bureaucratic delay. By the time they were on it the cost of a ditch big enough to stop it would have cost more than relocating the town. Thank you Andrew. I did a little more research and found exactly what you said and a lot more. Quite disappointing that the Government didn’t step in and put up the money in the beginning. Maybe it would of solved the problem and saved the town. I feel sorry for all the residents of the town and understand there dislike of the bureaucratic system. Our taxes at work again. This place sounds amazing and I want to visit! I am with Dark Moon Press and am currently writing a book on “paranormal activity” and was asked to visit this wonderful little town… I think I’m more excited about seeing the churches and cemeteries than anything lol I would never litter, disrespect the townspeople nor where their dead are buried! I’m guessing there are no hotels near by but can someone tell where the nearest one would be? Thank you for posting this article and looking forward to writing about in my book! The nearest community is Ashland, which should have some plays to stay, though I don’t think that there is a hotel there. To be honest, I’ve never heard of any paranormal activity at Centralia, but good luck in your quest. Fantastic!! Thank you Andrew!! When the time comes for me to visit, I would love to speak with you!! I, however, loved the quiet little town. I traveled along Graffiti Highway as they now like to call it. Which was the old route 61. I would love to go back sometime soon. It’s easy because I only live an hour away, maybe not even. I want to know is there anything else to see around that way? I love adventure and seeing stuff like this. I would never ruin graves or even litter. I don’t know or do I ever understand why people would litter? It does not make any sense to me. If someone can tell me of a few places I would love to go and take pictures and may of them. And share the stories that I have witnessed while I was there. Also be able to talk with some of the remaining people that still do live there. And learn more than we know about this little town. I’ve seen pictures from before and after, and I do wish that I was around back then to witness it. Thank you in advance. I’m probably oversimplifying the problem or it would have been tried. Three components are necessary for a fire: fuel (the coal underground), ignition (the original start of the fire), and oxygen (I assume present from mine shafts). Why could this fire not have been stopped by starving it of oxygen? Couldn’t the air shafts have been sealed shut? Simple answer… Rock is porous. It is almost impossible to starve an underground coal fire. Typically these fires are stopped by digging all around them so they coal seam is cut off and the fire cannot continue to burn once its current source of fuel is exhausted. Anthony, All the information that you need should be in this post. As for shoes, I’d wear hiking boots, more due to glass and trash than the difficult route. is The graffiti highway still closed off to the public? Park by the st Ignatius cemetery and walk down about 100 feet to the big yellow “left turn” arrows. Go up to the right and it will put directly into the highway. My parents and I visited on 12/26/16. It was nice to see a Nativity set at the main intersection, which suggests that the residents still care for their hometown. I plan on visiting Centralia in the summer. Where would you recommend parking a car before heading in? As Richard said, anywhere where there isn’t a no parking sign or where you would be in the way of traffic, should be fine. I’d also give a wide berth to the homes that are there so as not to bother residents. I have been to Centralia. I went there spur of the moment during a day trip from Harrisburg, PA to Reading, PA. On may way back to Harrisburg, I took the “scenic route” back. What remains of Centralia reminded me of a scene out of “Twilight Zone”. I do plan a return evening visit so I can take some photos. So it’s March 2017 and a group of my friends and me wanted to visit Centralia and take some photographs at sunset. Is Graffiti Road still closed to pedestrians? The Graffiti Highway has always been posted, they are just enforcing the ban more now. A few 4-wheelers and some crazy kids caused this. Not sure if this will ever be lifted. Mainly they are patrolling the area where the big cracks are in the road – Not so much the upper part. You can also still wander the area where the town stood – great for hiking. It is PennDot that is enforcing this so they can only enforce the state road! Hopefully they get tired of harassing visitors at some point. It’s really a shame that they are doing that. I totally agree that the ATVs and vehicles need to be off the road, but I see no reason to stop an average visitor from checking it out. thanks for the article!! We first started exploring back in summer of 2007. Awesome to see the old steps etc and we wanted to check in out a little later during the winter to see the snow melted on the “hot-spots” up on the hill. Didn’t make it but every summer since…. A year or two later we were saddened to see a few more homes were demolished…Of course no pics. A beauty was on the same side as the old Post-Office and VFW… A “trailer-home” and garage that was just opposite (across the street) the Fire/Ambulance building was torn down 2011 or 2012. That same area was where the old railroad tracks Railroad Ave??) were and looking at old pics, you can also see the old homes and businesses….Now just the street and grassy patch were the tracks ran. But what really upset us was the removal of all of the street signs… Before our trips we would look at the old pics so while we were there, could relate the buildings with the street names. Locust Avenue etc. Driving into town (across the street from the old VFW etc) and on the right, you can see the old foundations and what was really interesting was the paved back alleys!! Take care!! Jim Cheney, How would YOU put the fire out? I need ALOT more information about topography and rt 41 from the north of Centralia starting at the Susquehanna river basin. So I was surprised that you replied, I thought the site was dead. Good for us. re reading your reply, I get it, but you are there. Back to reality, I have been reading the DEP EPA site data, there are so many questions in my head. 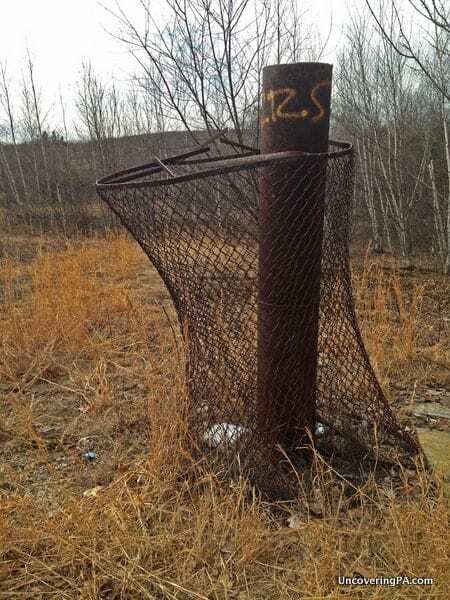 I read that there are around 2000 stand pipes as vents all around the area of Centralia itself. I was wondering about using sound at a single point and using microphone recording at the vents to measure volume of the mine. I viewed MANY reasonably suspect photos during winter easily showing WARM spots on the surface. I only read about the use of thermal imaging, no one offered photos that I could find. Any thoughts about who authors any of these reports that are offered? I honestly know very little about what has and hasn’t been tried at Centralia. However, I know that a lot of money was spent trying to put the fire out. I would imagine that anything that wasn’t completely cost prohibitive was tried at some point. I’ve always wanted to go to Centralia so my sons and I just stopped there on our way back home from a college visit at Bloomsburg on 3/27/17. There is no smoke to be seen anywhere. We parked and walked on graffiti highway for a little bit. The road didn’t feel hot. We were the only ones on it. There are no trespassing signs at the cemetery next to the closed highway entrance. Found out afterwards from several people that the state police are enforcing the no trespassing and giving citations to pedestrian and vehicle traffic on graffiti highway. We were there this past Monday (29May2017) on Memorial day, how fitting was that! There were a lot of people there. In some areas the ground did felt a little warm. There were No Trespassing sings on few trees along graffiti highway. Lots of 4 wheelers. Didn’t see the Odd Fellow Cemetery, I guess as one the comments mentioned it is cover with grass. The other two cemeteries are still there and in good shape. Although the smaller one was closed. Sorry I’m bad with names. We the Church way on top off the hill , we made our way up just to be disappointed there more than 10 signs, No trespassing, violators’ will be prosecuted and few sigs (ADT security surveillance camera) We were afraid to even try and take a pic. We saw a security guard at the mine near by so we stopped and ask, where the hot spot was. He replied ” the internet lies, there is no steam, no fire. Could see it 20 years ago but it is all gone.” We stopped by a pizza place in Ashland and asked the waiter the same question, She replied the exact same thing as the security guard, minus the internet lies. But we still saw what is left of the town. Saw house, there neatly kept. One of the three house ( I just found out) belonged to last mayor of Centralia (Carl Womer ) . He was among the people who stayed and refused to leave. He passed away sometime in 2014. The other house looked Abandoned, all windows were boarded up. All and all It was great experience. Planning to go back, maybe when it’s colder to see if can see steams and if the snow still melts in the hot spot. I also like to the Odd Fellow cemetery since I read the fire started near there and that if you stood there you could the steam. We were just there on 9/11. We didn’t see any steam either, but like you, we’re going to go back when it’s colder to see if we see it then. I’d like to see the mayor’s abandoned house, but it’s been badly vandalized. I’ve seen a before and after video on youtube. Sickens me how people do stuff like that. We walked by the church, there’s a nice little garden behind it and farther up a trail I think there were bee hives. I didn’t see the trailer there though, I wonder if they tore it down. We’re from New York, so coming down 42, we didn’t check to the left of town. After doing more research, I found out that’s where the Odd Fellow cemetery is and where the fire started. So we’re going to go that way on our next trip. Google Earth was a great help in finding things. Hopefully in the winter, it won’t be so overgrown and we can see more. Anyway, hope that helps a little. The Odd Fellows cemetery is across the street from the St. Ignatius and the entrance to the “Graffiti Highway.” You have to go down the street a bit and then it is off to the left. I tried very hard to get our state Representatives to do something that would allow tourists on the highway, even to the extent of suggesting it be turned into a state park. They response I got from them was extremely disconcerting – and I know these people on a first name basis as I am involved in politics. I am not sure what they are afraid of. Heck, people go to see “Old Faithful” all the time and the burning steam and potholes that open at random are certainly more dangerous than Centralia. I have though about trying to make it a national historic site, but not having lived there it is difficult. Most of the former residents would rather see it just forgotten, so getting any to support it as a memorial would be difficult. It is really a shame. I still think there is a conspiracy to sell the land to the coal miners once the last residents vacate… Of course, but that time we may not even be burning coal any longer! I have some information and photos on my author website at https://www.centraliapadevilsfire.com/ for anyone interested. When the town was still extant, there was a faction that believed that there was a conspiracy to take their land for next to nothing, in order to extract the coal beneath. This tin foil hat theory ignores the facts that there is plenty of easy accessible anthracite available on land already owned by coal companies. The bottom has fallen out of the anthracite industry in the 1930’s and has since gone in the toilet. Why fight a mine fire to extract worthless coal at a high cost? It boggles the mind how anybody could believe this. Many of the residents made very lucrative deals with the government for their homes. Property values in nearby Mt. Carmel are very low, with half doubles going for as little as $3,000.00. That’s three thousand, not thirty. The houses in Centralia were, in reality, worth very little on the open market, despite the fire. Some of the owners, especially those that hung in for the long term, made out very nicely. As far as the mining theory, the reason for the belief that the state wants to sell the mineral rights to the mining companies is that there is over 2 billion dollars worth of coal that is very near the surface. The only way to get at it is to strip mine – which means the town had to go. The state doesn’t care if it only gets a fraction of what the land is worth, it is still money in the coffers. I am not saying that this is or is not the case, just saying why the conspiracy theorists feel that way. I know the conspiracy theorists think this. But it is just not based on any evidence or reality. Discussing this, other than to dismiss it is like discussing the “fact” that Obama was born in Kenya. Agreed. I have been involved in politics for some time and haven’t heard anything from the inside about this. Makes for great fiction though! Why no one mentions this town or it’s people. Is there any work to prevent Ashland turning into another tragedy? Byrnesville isn’t generally mentioned, though a thorough research of the file will reveal information on the town. Byrnesville had only a very few residents. The fire pretty much burned right through Byrnesville. As for the coal, the mine fire started at the very southernmost part of Centralia, and burned south, sparing virtually all of the coal under Centralia. There is about $2 Billion at today’s market price beneath what was once Centralia. Andrew Shecktor, thank you for the info. I live in Bloomsburg, not far from Centralia. I’ve traveled thru there countess times and each time I see the steam rising up from beneath I’m in awe. Years ago one could feel the heat up to the knees when walking near the cemetery. Plus, if you scuffed up the ground steam would escape. Sometimes, I’ll admit I find myself holding my breath until I’m thru that stretch of road! I don’t know when the last post was made but it is July, 16, 2017 today. Yes the fire is still burning. Aerials were taken with a thermal camera and show 90% of the town has fire under it. As of today only 4 occupied houses left and one vacant home and business. As of today it is now enforced and people have been getting some hefty fines NO TRESPASSING ON GRAFFITI ROAD. I think what did it in with the enforcement was the food truck that would park on the north side of graffiti road and people just letting garbage everywhere. each day in that one little section you could gather at least 5 large bags of trash just from scummy tourist. Yes local scumbags use it as a dump too. if you do go there, you go at tour own risk and stay away from the homes people live in, they are sick of the trespassers. Stay away of the homes for sure. I was just there two weeks ago and there was no signage. Also, to the best of my knowledge, people have only been ticketed once, and then it was only people driving on the road, which is obviously dangerous. However, it is visit at your own risk, and you should always obey any signs you see. I visited Centralia today. As I was about to leave, I discovered three kittens in an abandoned lot near Rt. 61 and Graffiti Highway. I was able to catch two kittens before the storm hit. My boyfriend, my sister and I tried to catch the third one but it ran away. Please if anyone comes across this black kitten, rescue it or leave some food for it in your travels. Who or what organization has kept the Odd Fellows Cemetery records and plot-map? Or did the Odd Fellows just rely on the tombstone inscriptions as ‘the record’? My great, great grandfather, Casper Ziegler, a miner, 1844-1913, is buried there; however I’d need to know the exact plot location before traveling there from Florida. I would contact the Columbia County Historical Society. Societies often have cemetery records or know where to find them. Also try Find-a-Grave, and Graves a Million. Ask to have a picture made if there is not one. A couple of weeks ago I took my daughter and her friends to see centralia as they had heard about the new documentary and wanted to see the area it for themselves. We didn’t go to graffiti highway but met several people who were looking for it and we told them to do so at their own risk. we did cruise around some of the side streets so they could see where houses had been. Even the side streets are covered in graffiti including the guiderails on the hillside streets. We also checked out the cemeteries and the church on the hill. We saw no smoke. I rememeber driving through there in the 1990’s to go to reading and seeing the smoke and the vents. There’s a further twist to the cited “conspiracy theory” about the coal underneath Centralia. Literally the only way the fire could be extinguished involves stripping the entire mountaintop and uncovering the entire seam of anthracite in question. This would cost billions of dollars, might not even work, and would only make economic sense if the coal were then claimed for fuel/chemistry uses to partially pay for the massive job. Earlier estimates had put the seam’s value at $2-5 billion in 1970s dollars. The problem is, by an odd quirk of law and charter, the “Borough of Centralia” owns the mineral rights to the coal directly underneath it–the only such borough in the Commonwealth. Thus, the few hold-outs that constitute what’s left of the “Borough of Centralia” have, in the past, demanded compensation for those mineral rights, estimated to be about a billion dollars’ worth of that seam, and refused to budge absent such compensation. thou I will add, if you do decide to bring spray paint (We did not) please be respectful with what you leave. There are so many vulgarer, trash, and disrespectful things out there. Remember that thou there may only be a few left, this is still home to some! Their home and you are the guest so pleasebe respectful on what you leave, many eyes including children will see this! and take any empty cans and other trash with you! I drove through this town repeatedly as a boy and youth on my way to the Mennonite Bible School in Numidia. The story of the fire and the smoke made a deep impression on me. I saw the buildings systematically being torn down. I remember when they re-routed the road. I always wondered why they didn’t do whatever it took to extinguish this fire. I know that it is expensive. But to let it burn for years seems untoward. I was unable to sell my family’s home since 1897 to one prospective buyer because of the fire.